‘Wakamatsu-jo’ castle, also known as ‘Tsuruga-jo’,standing in the southernmost part of the inner city of ‘Aizu-wakamatsu’ in Fukushima Prefecture was rebuilt in 1965. 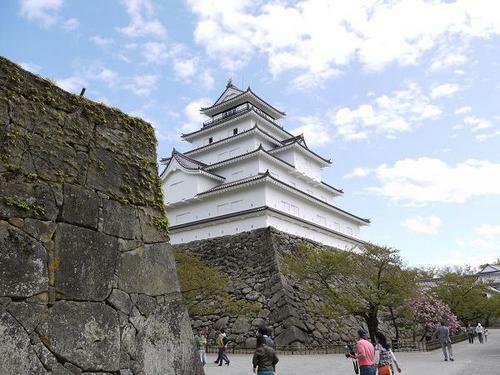 Although it has a history of seven hundred years, this castle had enjoyed the height of its prosperity warking as a hub of the central government in the Tohoku Region since the 17th century when ‘Hoshino Masayuki’ became the lord of the castle. ‘Hoshino Masayuki’ was an illegitimate child of ‘Tokugawa Iemitsu’ , the third shogun. Thus this castle was fiercely attacked by the revolutionary army against Tokugawa’s feudal government during Boshin War in the 19th century. After that, it fell into the new government’s hands to be demolished. Present building in the picture was rebuilt following the original faithfully after the Second World War. Find our Discount Airfares, Tours, Japan Rail Pass, Ryokan & more ! Must see places in Japan TOP 40, Japan's trend you want to visit again & again! Japanese Proverb, ’’Gaden-insui'’ ’’Gei wa mi o tasukeru’’ etc..
Kakunodate, "The Little Kyoto of Tohoku"